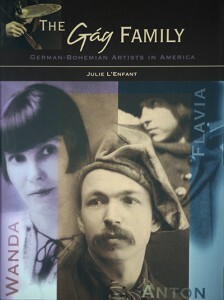 The Wanda Gag House Association was able to purchase the overstock of the book The Gag Family, German Bohemian Artists in America, by Julie L’Enfant. As a result we are able to offer this book to you at an exceptional value. The original suggested retail price was $37.50. Now, this beautiful hardcover is available to you for $7.50. Rich in visual records-paintings, drawings, and photographs of Anton Gag and his daughters Wanda and Flavia, this book explore’s the Gag’s family’s remarkable cultural journey from Bohemia to the American Midwest to New York and beyond. All of Wanda Gag’s children’s books are also available for sale in addition to family biographies, clothing, and other gift items. To order by mail DOWNLOAD ORDER FORM.